Does less beef mean less heat? Is meat, especially beef, not good for the planet? We see the marketing of plant based burgers. We also see work for lab grown beef. In the United States, agriculture and forestry are net carbon sinks (they capture carbon). In the US, beef is responsible for 2% of emissions. However, pasture is responsible for 3.9% of carbon capture. Agriculture is a net help in carbon emissions because of carbon capture! Further, carbon emissions are improving over time in agriculture. However, the news media is not telling this story. Emissions are not going down due to decreased consumption of beef. Emission are going down because of technology advancements. Productivity is a key driver in improving sustainability. We would need many more cattle, with much more emissions, if we produced cattle in 2017 they way we did in 1976. If we continue on current trends, global cattle herd will increase by 7%. However, if rest of world matched rate of improvement we see in U.S. cattle herd, we would see a decrease by 27%! If rest of world matched U.S. productivity, world cattle herd would decrease by 53%! What is the pounds of feed per pound of product for beef, chicken, and pork. 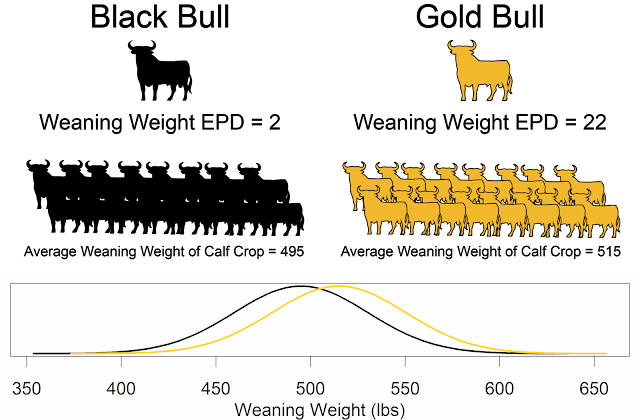 Beef takes 13.8 pounds of feed per pound of product. Chicken is at 1.6 and pork at 2.5 pounds of feed. However, beef uses 1.6 pounds of human edible feed. Chicken uses 1.4 pound of human edible feed and pork uses 2.0 pounds of human edible. However, what is the net protein contribution of these meats? In other words, how much protein does the animal eat and how much does the animal produce. Chicken and pork both eat more protein than they produce (0.85 for chicken, 0.70 for pork). Cattle contribute 2.53 pounds of protein for every pound they eat! Cattle take sunlight and turn it into protein. Further, cattle can produce food (protein) on land that cannot be used in any other way to produce food. A lot of feed used for beef production is used for maintenance of cattle (maintenance of cow, maintenance of growing steer). How can we improve sustainability of beef production? What can we take from our monogastric friends? Focus on both components of feed to gain ratio. We are likely no where near biological efficiency of cattle. Focus on red meat yield, decrease whole industry maintenance energy costs including improved fertility rates, and avoiding extra fat. 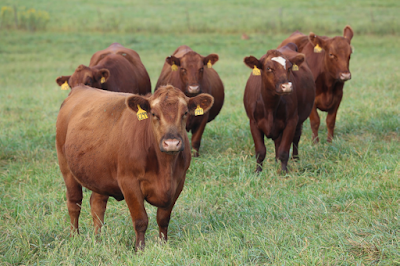 How can we take further advantage of ruminant cattle? Can we add more total gain on forage and reduce use of human edible grains? Beef's sluggish response to sustainability concerns left open an opportunity for "alternative protein". We need to tell the story of a self replicating technology that can take energy from the sun in the form of plants and turn it into protein. This technology is beef.